AeroGarden, at AeroGrow.com, gives you the opportunity to grow fresh vegetables, herbs, and beautiful flowers in your home, regardless of the time of year. With AeroGarden you can conveniently garden indoors and reduce trips to the grocery store. Grow lettuce, basil, tea, tomatoes, peppers, and more with AeroGarden. AeroGarden is dirt-free and guaranteed to grow. All you need is an AeroGarden, a seed kit, and select accessories, and you can start growing today. Before you try it, stop by RetailSteal.com for AeroGarden coupons, AeroGarden promo codes, and AeroGarden discounts. Enjoy free shipping on all AeroGarden orders over $50. AeroGarden ships to the 48 contiguous states, Alaska, Hawaii, Puerto Rico, Guam, and the Trust Territories. Return product within 30 days and get full refund. See site for full details as exclusions may apply. Use this coupon code at AeroGrow and enjoy BOGO 50% off on everything. Shop online at AeroGarden.com and enjoy up to $55 off select gardens. Sign up online at AeroGarden.com and receive $125 in free coupons. 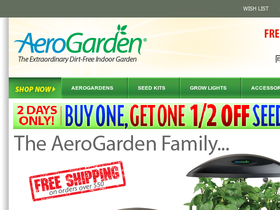 Enjoy free shipping on orders of $50 or more when shopping at AeroGardenStore.com. Shop at AeroGrow and find seed kits for as low as $9.95. Click link to place your order. Get free indoor gardening tips at AeroGrow. Click link for free offer. Enjoy a 10% discount on purchases from Burpee Gardening online today when you enter our coupon code at checkout. Use our coupon code online at Burpee Gardening today to save $15 on your purchase of $100 or more.